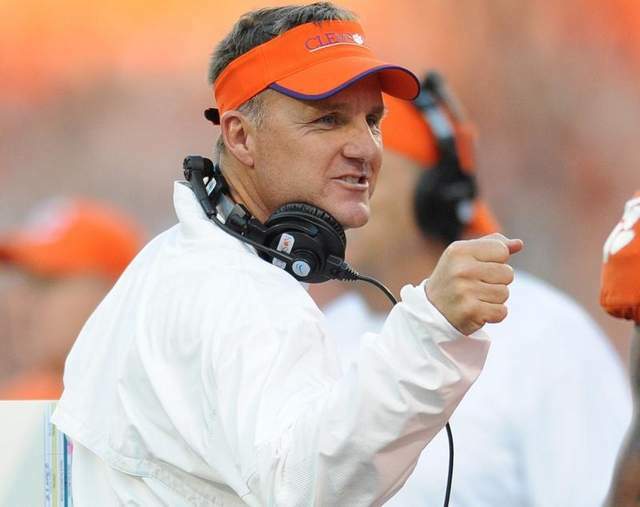 The Tiger Swag::by Willy Powell: Chad Morris: Should He Stay or Should He Go? A watched pot never boils, and you get the feeling Chad Morris is watching the pot of coaching vacancies, hoping the perfect BCS school boils over and calls his name. He is the hottest coordinator on the market and will have opportunities to become a head coach this year. But to his credit, he doesn’t want to just settle on any opportunity, he wants the perfect opportunity. But we think Morris ought to take the best job offered to him, not necessarily the best job on the market. Not because we want to see him go, but because these opportunities are not guaranteed. Every coordinator worth their salt wants be head man, but unfortunately, coordinators don’t always lead the watch list (though they should considering 15 of the Top 25 teams have coaches with no prior head coaching experience). The reason we think Morris ought to take the best job offered is the fear that if waits for the perfect job, he may never get it. There will always be job openings in college football. You can stack that up with death and taxes, but there aren’t always good job openings. It’s not every year 3 SEC schools not named Kentucky have openings, and it’s not every year perennial bowl level schools like Cal, NC State, and Wisconsin have openings. Just this year, there have already been 13 BCS schools with vacancies, which equals the average over the last 3-4 years. And the number should only grow as coaches move around. One example Morris should follow is his mentor Gus Malzahn. Malzahn had opportunities to coach mid-level BCS teams following their National Championship in 2010, but he kept waiting. After a rather disappointing season at Auburn, Malzahn left for Arkansas State. Most people thought he was nuts and felt like he settled. Twelve months later Auburn goes 2-10, fires their coach, and in steps Malzahn. Some could say Malzahn lucked out, but if he waits one more year at Auburn looking for a better gig, he may have been a casualty rather than a savior. On the other end is Bud Foster. Foster never settled for lower level schools, but rather waited for the perfect school. And a few times they called for interviews, but he never got THE call. Now, his star has dimmed and the opportunity has passed. More than that, his job as coordinator is beginning to be questioned. He is fighting to keep this job rather than looking for a better one. The good news for Morris is his cupboard is full at Clemson, at least for another year or so. The skill positions are stocked and the offensive line is experienced. He can wait to see if anything better presents itself. But what happens if next year’s crop is nothing but Duke’s and the Big East? What happens if his perfect job does come, but he doesn’t get it? What happens if Clemson becomes ravaged by injuries or struggles offensively? Or worse yet, turn into Auburn? Or even worse than that, fails to succeed against USC? There are no guarantees in life, especially in football, and if Morris finds a solid school where he can install his system, recruit his guys, and win some games, then he needs to take it. Dabo took a risk with Morris and it rewarded Clemson immeasurably, but both Dabo and Morris know this is a business. And Morris owes Dabo and Clemson nothing he hasn't already given them. Morris has given Clemson the best he has and Clemson has returned the favor. If Morris decides to wait it out, "Great"! Clemson will be a National Championship contender. If he decides to go, "Good Luck and Best Wishes". Clemson will still be a National Championship contender, just one with a few offensive question marks to go with the defensive ones. Coach Morris, the choice is yours. Take advantage of it and do what is in the best interest of you, your career, and your family. Clemson thanks you, regardless.